Just as there had been a flourishing of flowers that brought colour and shape of all manner throughout the forests of planet Earth, so too was there a burst of humans reflecting the diverse landscapes and climates across the great continents, grand brush strokes of language, song and dance, creed and shade, all speaking to their lands and their lands through them. No much more so than in India where diversity is of a scale only comparable to the densest of rain forests where we still remain uncertain of the depth of species, flora and fauna, that we have yet to know and learn from. 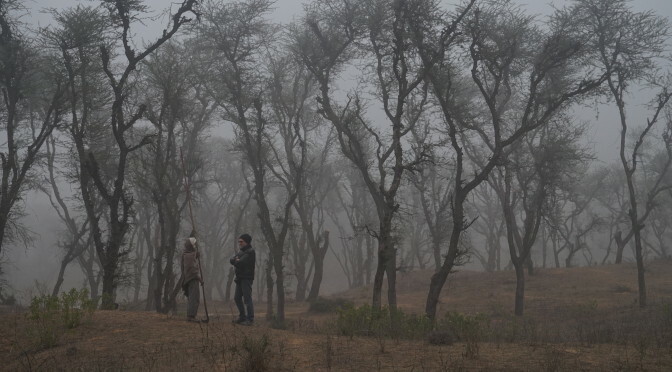 Between Alwar and Baran (Rajasthan, India) we passed a forest from which trees emerged, penetrating the early morning mist as broken arms clutching at the air, a landscape rent and torn by illegal sand-mining. Three camel drawn carts were loaded up with sand quarried by hand. We stopped to shoot this enterprise and in doing so sought permission from the villagers there. They agreed, for a small fee and we obliged. When the villagers were done we moved deeper into the forest to capture material for my serene, reflective cutaways. Each of us found a zone of our own, documenting what we saw there either on camera or through personal reflection. I sought to walk and look deep into the mist. It was at such a moment that a shepherd emerged. His crook as tall as a small tree. We spoke through hand signs and gestures. We were both curious about each other. Clearly I wasn’t someone he would regularly meet there, an alien on his home lands, and I certainly wasn’t expecting to chat quietly with a shepherd. We communicated without any sense of indifference. As we spoke a member of my local crew walked towards us with an urgent stride, whipped out his smart phone, remarked on the length of the shepherd’s crook and prepared to take photos. I asked would he mind requesting permission first, to which he replied, “Here we don’t ask.” “With all due respect,” I responded, “on my shoot we ask.” To which my request was ignored and photos merrily taken. Communication that had been found in silence and respect, in mere moments, was extinguished. Indifference and disregard were themes that I would find a constant challenge throughout the shoot, described to me as commonplace attitudes found throughout the country. What is commonplace is that there is nothing common between regions, states, tribes, the minutiae of lives in buried in slums and the makeshift dwellings nomads and the homeless construct on the open road, in fields, beneath freeways. If there was ever a place more deserving of suspended assumption, it is India. It’s not so much that people are indifferent to each other, there is a learned system of responses hewn from a culture of many cultures. There is no one India. It can not be personified in any single artifact nor language. It can’t be drawn, exposed nor compared to anything. There are simply too many variances, too many nuances, too many histories and layered differences. Indifference is a strategy. I try to be open to everyone, to all experiences, but there is a kind of madness that comes with that. Because one can not know the layers, one can not know why people say one thing to someone else and another to you, both statements contradicting each other, but to someone who does know it makes sense – it makes sense that it makes no sense! Try experiencing this a dozen or more times each day for a month. I say to myself more than anyone else, best see India as a complex country of countless differences where every shadow cast is contoured by the dust of a millennia lives decomposed and transformed into nutrients absorbed into every single tree left standing. Photo by: Cathy Chen (taken from a respectful and non-intrusive distance. Joy and wonder is defense against madness, and yet there is a madness in joy and wonder. It was Bertrand Russell who said a good life is one guided by love and knowledge. Pretty much sums it up.